I’m hosting David Milch at the Writers House next spring. I’ve long been a fan of this quirky genius. To prepare, I’m reading and watching. First up: Hill Street Blues. Milch, it’s said, rescued the show from its tendency toward silliness. “Trial by Fury,” the first episode of season 3, was all his — and it won an Emmy. I think this was Milch’s very first crack at a teleplay. Amazing. I’ve tracked every show Milch wrote (is credited for writing) — many in seasons 3 and 4, and two near the end. For the very latest episode, May 12, 1987, in season 7, they brought Milch back. The result is “It Ain't Over Till It’s Over,” of course. 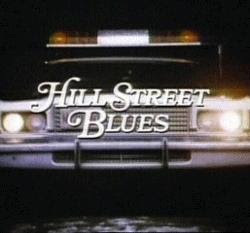 Here’s a PDF giving you of all the Milch-written Hill Street Blues. Some full episodes are available on Hulu. Only seasons 1 and 2 are available, so far, on DVD. Season 3 is available in a new-ish service provided by Amazon; you pay $1.99 to watch each episode on demand. Later: Patrick Dillon points out to me that Hulu offers all season 3 episodes for free: here.